The Supreme Court of the United States is the highest court, and more than 10,000 cases are sent to the court each year, though the justices will hear less than 100 of them. The session begins on the first Monday in October with the first oral arguments. Each argument lasts for one hour. Each side is allotted 30 minutes to argue and answer questions before the court. There is extremely limited seating for the public. But if you prepare in advance, you can attend an oral argument. Find out the dates the Supreme Court plans to hear oral arguments. You can take a look at the argument calendar available on the Supreme Court’s website, or at the Supreme Court building. You may also hear about upcoming oral arguments in the news. Note how many cases the court plans to hear in a day. The first case always starts at 10 a.m. The second begins at 11 a.m. If there are more than two cases, the third starts at 1 p.m. and the fourth at 2 p.m. There are never more than four cases heard per day. Dress appropriately. It is customary to dress up for the court. This means a nice pair of slacks and a dress shirt. Some people may choose to wear jeans or less formal attire. If staffers within the court have a problem with your clothes, you may not be allowed inside during an oral argument. Line up outside the court early. There is extremely limited seating, so if you want to sit in on the first case, you will have to be near the front of the line. As a rule of thumb, arriving at 8 a.m. or earlier is your best bet to get a seat. Indicate how long you plan to stay. There will be two lines to get inside the court. One is for members of the public who want to sit through an entire oral argument. The other is a line for people to view the court in session for three minutes. Throw away liquids, food and any banned objects. Obviously, weapons are not allowed. Liquids are also banned, and there are several items that you will not be able to bring with you through security. Check with the U.S. Supreme Court website, or call the court for an updated list. Lock your valuables in the cloakroom. You will need to place your cell phone, camera and anything else that could make a noise, in the locker. Even if you turn your devices off, they are still not allowed. Women are allowed to bring in their purses. You can lock up your items for 25 cents. Be quiet. Once you are inside the building, you are asked to speak quietly. And once inside the court, you are asked to whisper. When court begins, you are not supposed to talk. Be respectful. When the justices enter the courtroom, you must stand. You also must stand when the justices leave. Once the justices leave the court, you must immediately leave the courtroom. Mastis, Lindsey. 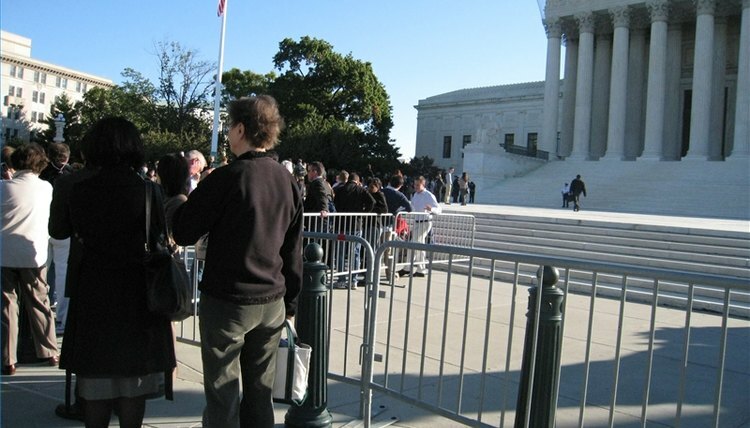 "How to Attend an Oral Argument at the Supreme Court of the United States." , https://legalbeagle.com/4550327-attend-oral-argument-supreme-court.html. Accessed 19 April 2019.